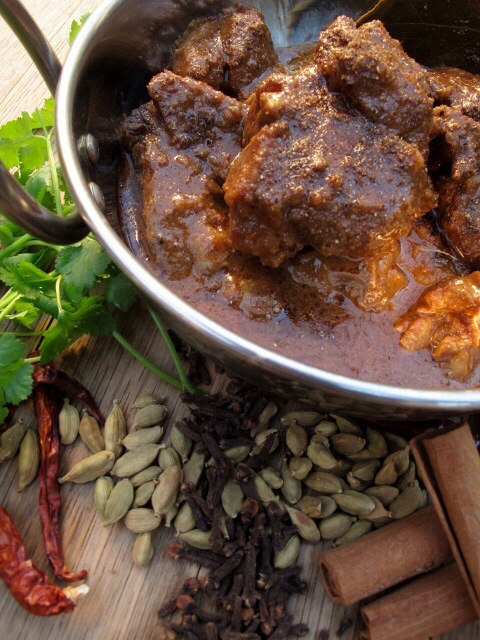 Arguably the King of Indian Curries, Rogan Josh is one of the most recognised Indian curries outside of India. Sadly, its ubiquitous stature has done it no favours beyond the borders of the sub-continent. Like many noble dishes before it, Rogan Josh has suffered from the inevitable gentrification that comes with Western popularity. Along with its equally maligned cousin Butter Chicken, Rogan Josh has been largely reduced to a synonym for a generic lamb curry. This is an absolute tragedy because Rogan Josh deserves its enduring popularity, it just shouldn’t have to suffer because of it. In its true form, it is an amazing curry; incredibly tasty and surprisingly easy to make – it is my top pick for any Indian feast! Mix the garlic, ginger, cumin, coriander, chilli powder and paprika in a large bowl. Add the onions and sauté for about 10 minutes or until lightly brown. Be careful not to burn them. Remove the onions from the pan, leaving the ghee/oil in the pan. Add the cloves, cardamom, bay leaves and cinnamon and gently fry for a minute. Increase the heat to high and add the meat and onions, mix well and fry for a few minutes. Reduce the heat and cover the pan. Take off the cover and increase the heat. Fry for another 5 minutes, allowing the sauce to reduce and the oil to separate. Add 125ml (1/2 cup) of water from the kettle, cook for about 10 minutes, until the sauce reduces again and the oil separates. Add 250ml (1 cup) of water from the kettle, partially cover and cook on a reduced heat for an hour or until the meat is tender. Keeping the heat low, stir in the yogurt and mix gently to combine. Add the saffron, if using. Sprinkle over the garam masala and stir. Season with salt to taste. Enter your email address to follow The Muddled Pantry and receive notifications of new posts by email.